Submitted by dave on January 30, 2007 - 2:01am. 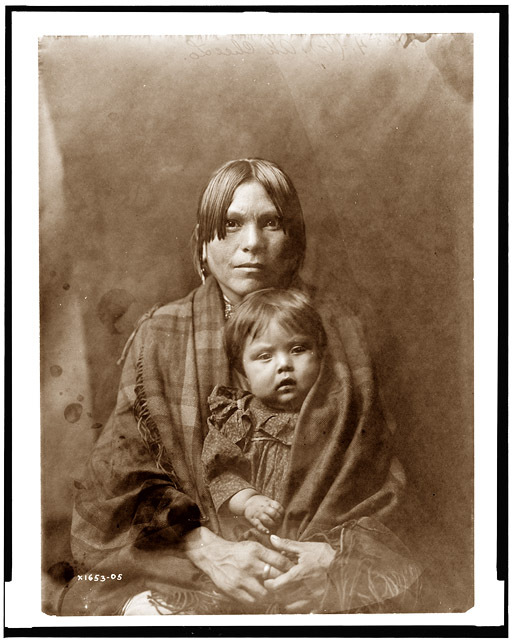 A Pueblo woman and her baby in a circa 1905 photograph by Edward S. Curtis, probably taken in New Mexico. There are more Curtis photos here. Submitted by dave on January 29, 2007 - 12:12pm. Particulars of the Duel Between Lieutenant Mowry and Mr. E. E. Cross. TUBAC, Arizona, Saturday, July 9, 1859. Submitted by ken on January 28, 2007 - 9:51pm. LEXINGTON, Ill., Dec. 27 - News of the lynching of Thomas P. Kerr, at Pioneer, Arizona, was received here this morning. His mother and sister are crushed by the intelligence. Kerr had many warm friends, and was not a desperado, and people here refuse to believe that he killed Hartley without grave provocation.